I was, in an odd sort of way, looking forward to a pro-Covenant group. I thought, perhaps it would sharpen up debate. At least it might ensure a better informed debate. But no. The new 'Yes to the Covenant' group (all 3 of them to date) is as vague and vacuous as other defenders of the Covenant have been. Once again, they don't tell us what the Covenant actually says - though at least they have the grace to link to the text. Instead they work by insinuation and assertion. In their strapline Serious about uniting Anglican worldwide, and why they think we should support the Covenant, they imply that they and they alone are concerned for the unity of the Communion. They're not. They assert that there is no alternative. Of course there are always alternatives. They assert that to reject the Covenant would tell those Provinces which have already signed that they are not needed. Nonsense. Provinces may quite properly come to different conclusions on the issue. How can we really call Anglicanism a single global entity, when some Provinces subscribe to radical new doctrines which others cannot accept, and when Provinces set up new churches within each other’s territories? In 2008, divisions deepened when some bishops, and some whole Provinces, boycotted the Lambeth Conference. But the question merely restates the starting point of the Windsor Report. It doesn't move us forwards. Though I assume they wish us to draw the conclusion that those who boycotted Lambeth 2008 are telling those Provinces of the Communion that did attend that they are not wanted. How are the new structures envisaged in the Covenant to be accountable to the Provinces? Legally members of the Anglican Church are those which are named in the Appendix to the Constitution of the Anglican Consultative Council. 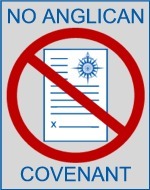 What are the legal implications of a Covenant - and of Section 4 in particular - in relation to Anglican membership? What are the ecumenical implications? Will all current agreements that are less than Communion-wide need to be re-negotiated? How, if some Provinces sign, some don't and some can't, is the unity of the Communion helped by the Covenant? Are GAFCON or Global South Provinces all likely to sign the Covenant? How will introducing a combination of policing and sanctions strengthen the bonds of affection between Provinces? How is objectivity or natural justice to be served if all the decision makers are inter-linked? Or, conversely, will the manner in which the Covenant is likely to re-shape Anglican politics serve the whole church or merely the international elite? How will the Covenant reduce conflict - as opposed to providing new routes and arenas through which conflicts are fought, or storing up resentment in those places which, led by the Spirit, wish to try new faithful developments? What will be the constitutional implications for the Church of England? And, will someone please tell me, what will it cost?